Chart Settings > Chart Type  Enables you to select a chart type. 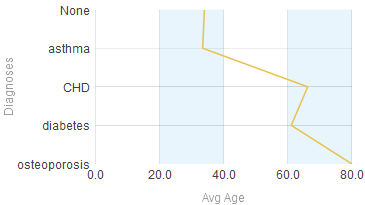 Chart Settings > Size & Appearance  Provides options to control the chart overall. 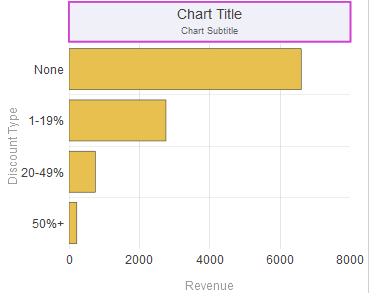 Chart Settings > Titles & Labels  Provides options to control the text and formatting of titles and labels on the chart. Chart Settings > No Data Warnings  Provides options to control an optional warning if there is no data to display. 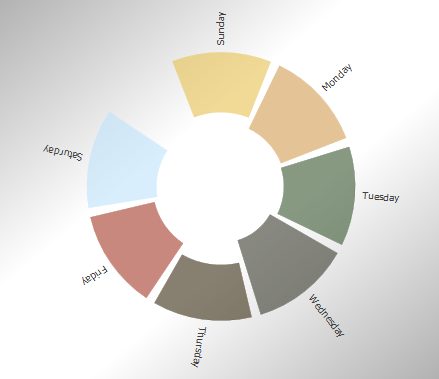 Chart Settings > Colors & Style  Provides options to control colors and line styles in the chart. 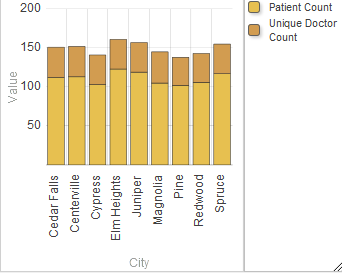 Chart Settings > x Axis  Provides options to customize the text and formatting of the x-axis of the chart. 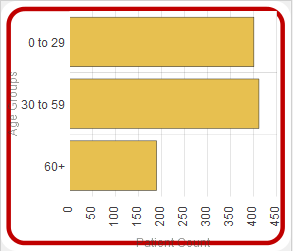 Chart Settings > y Axis  Provides options to customize the text and formatting of the y-axis or y-axes of the chart. 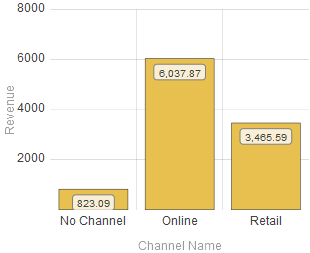 Chart Settings > Series Details  Provides options to customize how each series (row of the data source) is displayed. 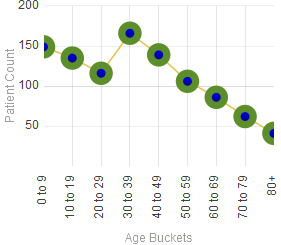 Chart Legend  Provides options to disable, enable, and customize the chart legend. The easiest way to systematically alter the appearance of dashboards is to define and use themes, which are discussed in Defining and Using Themes. Themes use the options described in many of the following subsections. Margins  Use this submenu to customize the margins of the chart. Use the Top, Left, Right, and Bottom sliders to separately control the top, left, right, and bottom margins. For each margin, use the Units setting to specify the margin either as a percentage of the widget size or in pixels. Or specify Units as Auto to use the default margins. This option is recommended for pie charts and tree maps. Pivot (applies only to charts that have x- and y-axes)  Select this option to switch the x- and y-axes. This option affects only the series that are displayed as bars. 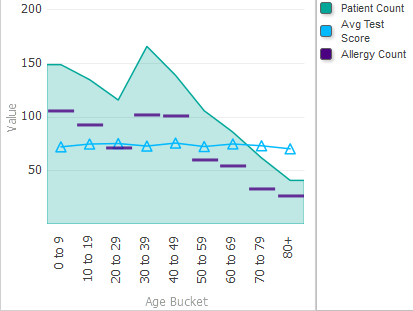 Filled (applies only to line and area charts)  Select this option to control whether DeepSee fills in the area below the series lines on the chart. This option applies only to charts that have x- and y-axes. 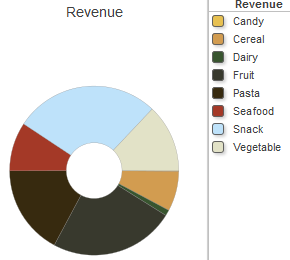 Pie Size (applies only to pie charts)  Use this option to control the radius of the pie chart. The default hole size is zero. 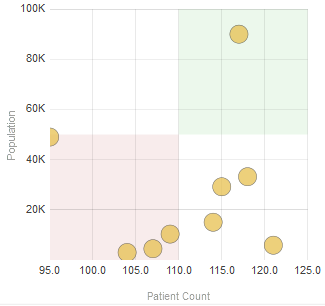 Radius (applies only to bubble charts)  Use this option to control the basic size of the bubbles in a bubble chart. Opacity (applies only to bubble charts)  Use this option to control the opacity of the bubbles in a bubble chart. Plot By (applies only to swirl charts)  Controls how the wedges are colored; this is particularly useful if the underlying pivot table displays multiple columns. 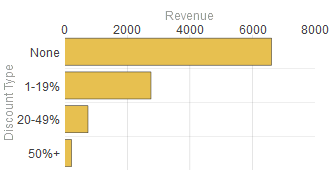 If you click items, the chart uses similar colors for the all wedges that belong to the same row in the pivot table on which this chart is based. 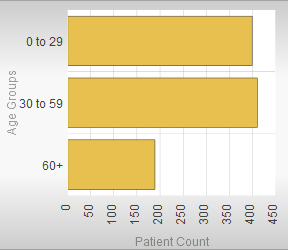 For example, the following swirl chart is based on a pivot table that uses Patient Count and Allergy Count for columns. Notice that, for example, Sunday has two wedges of similar color; one is for Patient Count and the other is for Allergy Count. See Specifying Chart Text Styles, earlier in this book. 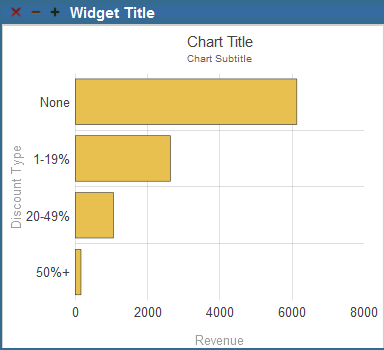 Subtitle  Use this option to specify an optional subtitle within the chart. See the example for Title. 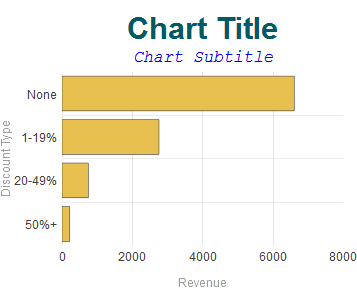 Subtitle Style Use this submenu to control the style of the chart subtitle. See the example for Title Style. Title Align  Use this option to control the alignment of the chart title and subtitle. These titles can be left-aligned, centered, or right-aligned. See Specifying Line Styles, earlier in this book. In this example, the titles are also left-aligned (see the Title Align option). Image Width, Image Height, Image Top, and Image Left  Use these options to control the size and position of the optional title image. This example also uses the Value Labels option (which controls the labels shown at the top of each column). To understand which labels are controlled by this option, recall that the axes of the chart are determined by the axes of the pivot table on which the chart is based. 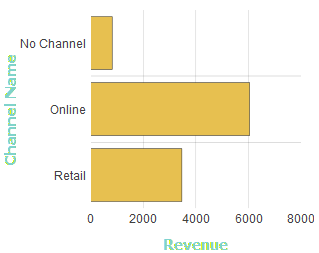 For example, the preceding chart is based on a pivot table whose x-axis (rows) displayed No Channel, Online, and Retail and whose y-axis (columns) displayed Revenue. In this example, Label Length is 5. You can also separately control the style of the x-axis and the y-axis or y-axes. 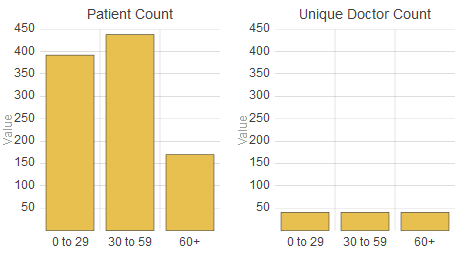 Value Labels (applies only to bar charts)  Select this option to display a label above or next to each column, indicating the value displayed by the column. For examples, see Labels and Value Style. This example also uses a non-default option (#.###) for Value Format. See the next item. Value Format Use this option to control the numeric formatting of the value labels. See the example for Value Style. For details, see Specifying Numeric Format Strings, earlier in this book. No Data Message  Type the message to display if there is no data to display in this chart. Warn if no data?  Select ON to display the given message if there is no data. The message is shown in a box in the widget as shown after this list. The default is OFF. Background opacity  Specify the opacity of the background of the box that contains the given message. The value 1 means 100%. Background color  Select the color of the box that contains the given message. Message color  Select the color of the message. 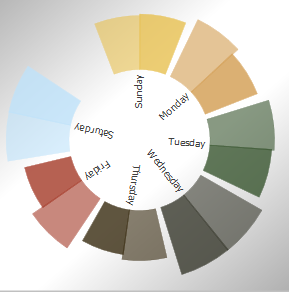 Series Scheme  Select a scheme, which is a set of colors to use for the series shown in this chart. Plot Style  Use this submenu to specify the style of the series that are plotted in the chart. 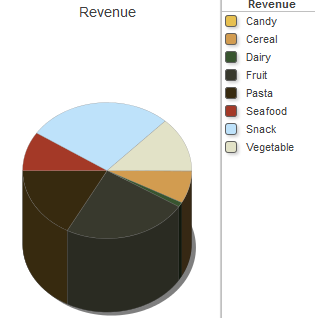 This submenu affects only bar charts, area charts, and pie charts. The Plot Style menu treats all series in the same way. Also note that this menu overrides the options in Chart Settings > Series Details; see Series Details, later in this chapter. Base Line Style  Use this submenu to specify the style of the base line (if any) in the chart. To specify a base line, see the Base Value option in the next section. Markers Visible  Enable this option to display markers in the chart. Marker Size  Use this option to modify the size of the markers (if any). Indicator Style  Use this submenu to specify the style of the indicator (if any) displayed in the chart. See the previous item. Upper Style  Use this submenu to specify the style of the upper band, if any. Band Lower  Type a value to define a lower area of this axis that is styled as a band. See the example for Band Upper. Lower Style  Use this submenu to specify the style of the lower band, if any. This example also uses Stripe Style. Stripe Style  Use this submenu to specify the style of the stripes, if any. This example also uses a non-default value for Border Radius, discussed later in this list. Border Offset  Use this option to modify the position of the border, relative to the background. Border Radius  Use this option to modify the radius of the corners of the border. By default, these corners are right angles. For a non-default example, see Border Style. The key for each item must be the exact display name of a series in this widget. The value for the item must be a CSS color value. You can use any legal CSS color name. You can find these at https://www.w3.org/TR/css3-color/ and other locations on the Internet. Then, for the Data-driven Colors, Termlist option, type the exact name of the term list. 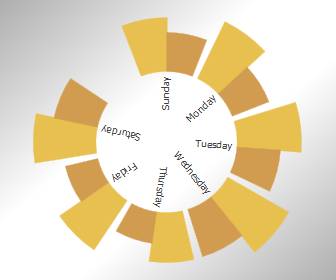 If this term list does not include a term for a given series in the widget, DeepSee displays that series in gray. Note that this feature does not provide any support for localization. For details on the submenus, see Specifying Line Styles, earlier in this book. Axis Title  Specify the title to use on the x-axis. By default, this title is taken from the data source. Major Grid  Use this option to enable or disable lines that mark major positions on the x-axis. By default, these lines are on. Minor Style  Use this submenu to customize the style of the lines that mark minor positions on the x-axis. This example also uses the Label Angle option. 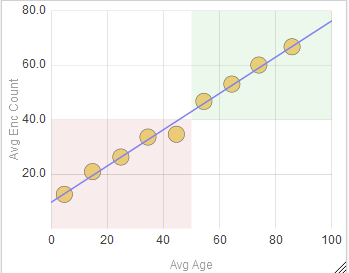 Label Angle  Use this option to specify the angle of the labels of the x-axis. See the example for Label Style. 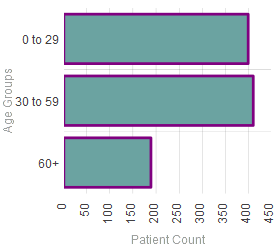 Axis Type  Optionally select % to express the values on the x-axis as percentages. If you select this option, DeepSee multiplies the values by 100 and displays % at the end of each value. 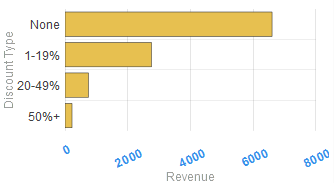 Min Value  Use this option to specify the minimum x value shown in the chart. If you use this option, the chart is rescaled to start at this minimum x value, and lower data points are ignored. 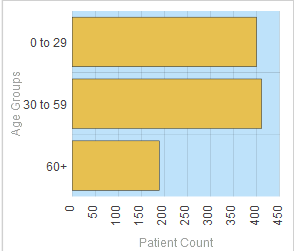 Max Value  Use this option to specify the maximum x value shown in the chart. 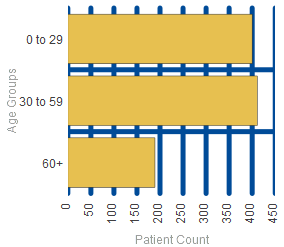 If you use this option, the chart is rescaled to end at this maximum x value, and higher data points are ignored. 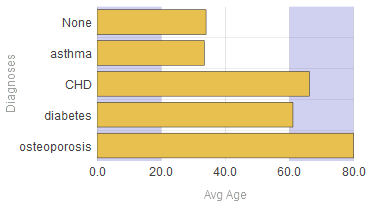 This example also uses the Base Line Style option in Chart Settings > Colors & Style; see the previous section. 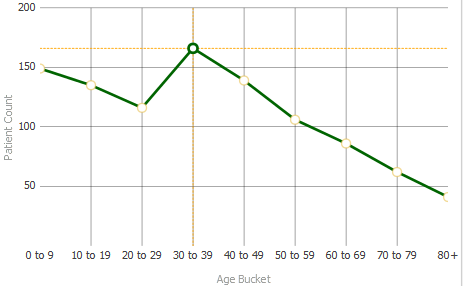 The same options are available when you customize a y-axis. Add a y-axis. To do so, click the plus sign button. DeepSee immediately adds a y-axis. Remove a y-axis. To do so, click the X button in the row for that axis. Rearrange the y-axes. To do so, drag the axis handles to the left of the axis names. 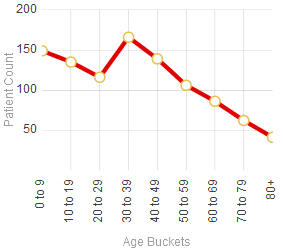 Customize a y-axis. To do so, click its name to display a submenu of options. For details on this submenu, see the previous section. 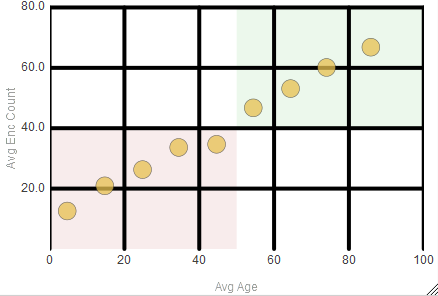 Some options, include Major Grid, Major Style, Minor Grid, and Minor Style, are supported only for the primary y-axis. 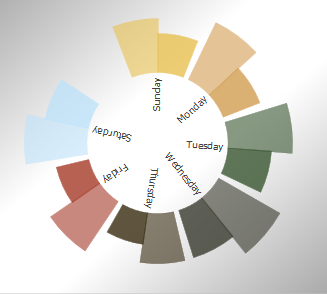 DeepSee uses a default set of colors that it uses for each series (a row in the data source). You can override these. For line charts, you can also customize the markers used for the data points. To customize how each series is displayed in a chart, access the Dashboard Editor, select the widget as described in Reconfiguring a Widget, click Chart Settings > Series Details, click a series, and then use the options listed there. Color  Specify the color for this series. For information on specifying colors, see Specifying Table Text Styles, earlier in this book. y Axis  Specify the y-axis with which to associate this series (either 1 or 2). Note that both y-axes are displayed in the same position by default. 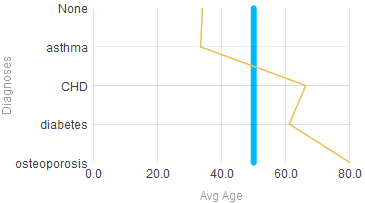 To change this position; see the Label Position option in Chart Settings > Y Axis. 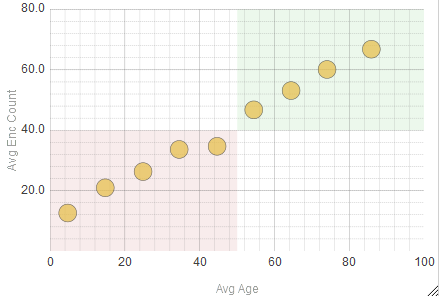 Plot Type (combo charts)  Specify the plot type to use for this series. 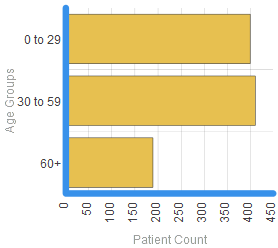 Marker Shape (line, area, combo, and time charts)  Specify the marker shape to use for data points displayed in this series. 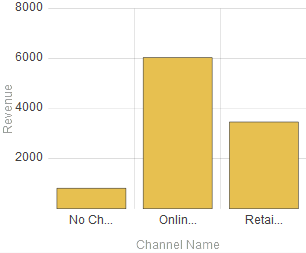 Position  Select an option to specify the location (if any) of the chart legend. Select right, left, top, bottom, or none. 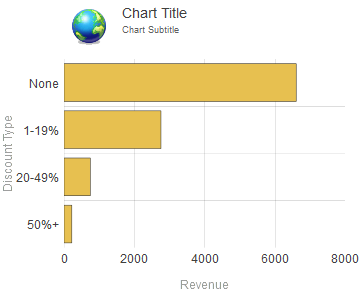 Title  Specify the title to show in the chart legend, if you want to override the default title, which is based on the chart definition. Show Title  Select ON to display the chart legend title. Or select OFF to hide it. 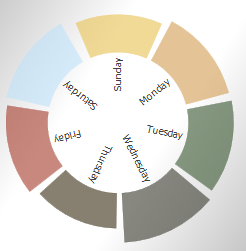 Background  Specify the color of the background of the chart legend. See the preceding example. Opacity  Specify the opacity of the chart legend. The value 1 means 100%. Font  Specify the typeface of the chart legend. Font Size  Specify the size of the text of the chart legend. 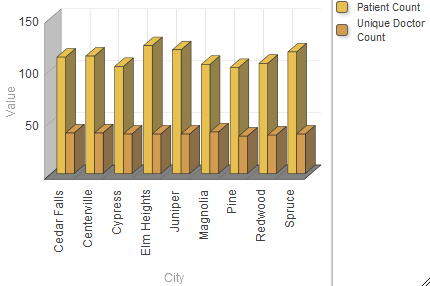 Text Style  Specify the style of the text of the chart legend. Padding  Specify the horizontal and vertical padding before and after the legend. Width  Specify the width of the legend. Height  Specify the height of the legend.